The first book I published was called Atheism and Naturalism and it came out in first edition in 2009 and the final edition came out April 12, 2010. It thoroughly explores the question of whether God exists and digs a little into the Abrahamic faiths, addressing some of the specific arguments of Christians, Jews and Muslims. On January 1, 2012 I published my second book, Selected Essays. 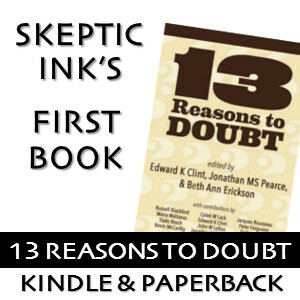 My personal favorite, it’s a collection of 12 essays, most of which were originally published on the now-defunct website DB Skeptic. It’s classic essays of mine carefully thinking about whether spontaneous cancer remissions are miraculous or not and the nuts and bolts of how we can really know the truth on the subject instead of casual dismissal. Extraordinary Claims, Extraordinary Evidence and the Resurrection of Jesus is a scorching criticism for arguments for the resurrection of Jesus. It is a full-blown offensive essays and sharp defense of “Extraordinary Claims require extraordinary evidence.” Also has a very extended Q&A covering many specifics that come up in resurrection debates and common claims from Christian apologists.